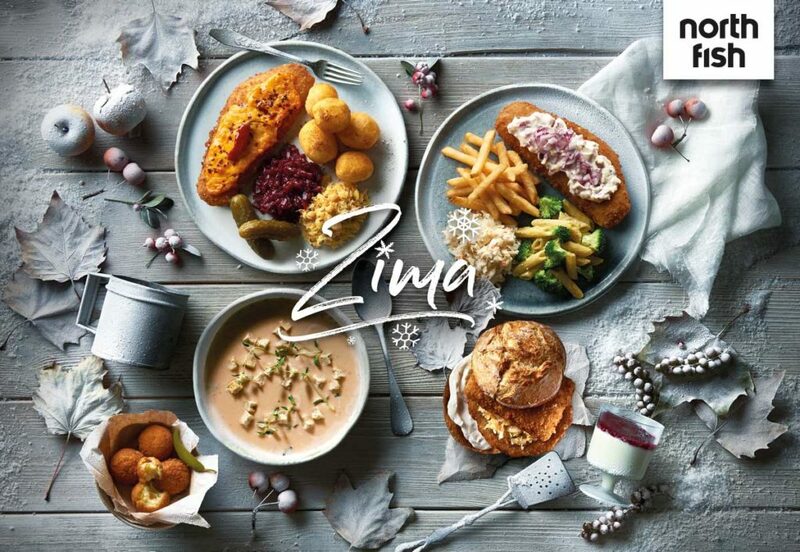 Zima w North Fish | North Food Polska S.A.
A new winter product range is available at all North Fish restaurants all over Poland, which adds to the menu two versions of the customers’ favourite pollock in batter and panna cotta with blackcurrant. On 7th January, the familiar Winter Fishburger and seasonal cheese soup returned. Red Onion Pollock is a juicy piece of fish covered in our original sauce and sprinkled with chopped red onion. The Hot&Cheese of this fish is recommended for those who like spicy food. The battered pollock is served with onion sauce, excellent cheddar cheese, chilli flakes and piri-piri peppers. The Winter Fishburger, famed for its flavour and originality, is back in the sandwich selection. A roll baked in-house contains a juicy piece of pollock in golden batter, a delicate potato pancake and pickled cabbage. The flavour is rounded off with a distinctive garlic and herb sauce. Specially for guests of the restaurants, the winter menu once more includes filling cheese soup, prepared from vegetable stock and served with crunchy croutons. And for dessert we recommend panna cotta with blackcurrant mousse, based on veggie cream and milk. The winter offer at North Fish restaurants lasts until 10.03.2019. North Fish is a chain of restaurants specialising in fish, seafood and vegetarian dish. The first was opened in 2002 in the Galeria Echo shopping centre in Kielce. Currently North Fish operates 46 restaurants located in Poland’s best shopping centres, which makes it the country’s unquestioned leader and Europe’s second largest, chain of restaurants offering fish and seafood. Each day nearly 1,000 employees take care to ensure the highest quality of the products served.